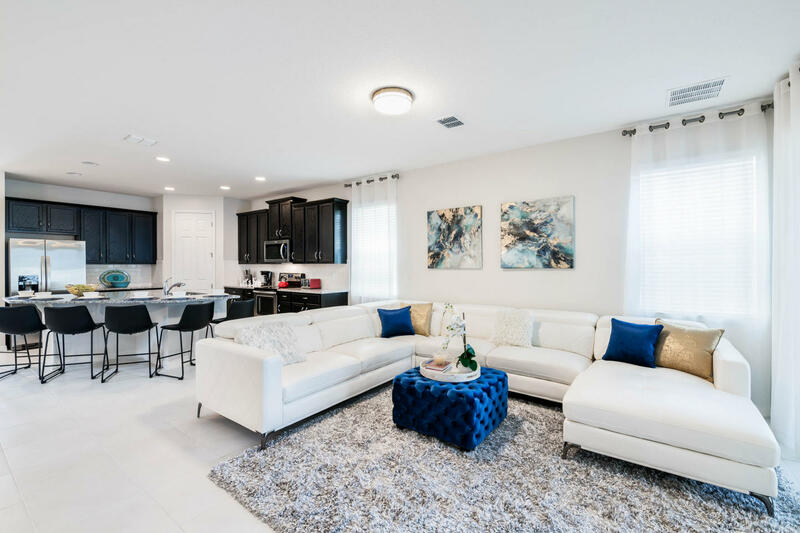 Brand new home in the newest luxury resort in Orlando! 8 Bedroom single family home featuring 6.5 bath, sleeps 22 with private swimming pool, spa and game room! Fun for the whole family! This home features 3 king master bedrooms with private bathrooms, a Frozen-themed bedroom, a Marvel-themed bedroom, a Star Wars-themed bedroom, a bedroom with a queen bed, and a bedroom with a double bed and twin bed. There are also plenty of bathrooms for everyone (6.5 bathrooms). The main living area has an open plan, along with plenty of comfortable seating and a wall mounted 65” UHD smart TV - perfect for a family movie night! After watching some movies, let the games begin in the Super Mario-themed game room! There is a fully equipped kitchen for all your cooking needs with breakfast bar seating - perfect for children. Enjoy your meals in the dining room or dine al fresco at the patio table. Two bedrooms are downstairs - consisting of one king master bedroom with its own bathroom and one bedroom with a double bed and a twin bed. Downstairs there are two complete bathrooms and one half bathroom. Upstairs you will find two bedrooms with king beds and private bathrooms, a Marvel bedroom with two full size beds and an oversized TV with seating for the kids to watch their own movies, a Star Wars bedroom with a twin over full bunch bed, a Frozen Theme bedroom with two full size beds that shares a Jack and Jill bath with a queen bed bedroom. There are 4 complete bathrooms upstairs. This home is equipped with a full-size washer and dryer to offer you the ability to pack light for your trip. All bedrooms are equipped with an oversized UHD TV. The house is located next to the amazing Solara clubhouse which is just a short walk away. Solara Resort features a competition-level FlowRider Surfing Simulator, allowing you to hang out and catch waves all day long. Enjoy the heated grand pool, sand volleyball court, soccer field, basketball court, a state of the art 13,000 sq. ft. clubhouse with an on-site concierge, a well-equipped fitness center, children’s playground, game room, children’s splash pad, water slides, workstation, teen center with video games and sports simulators, sundry shop, and a recreational area. There is also a restaurant and a pool bar. In addition, Solara is security gated - 24/7. 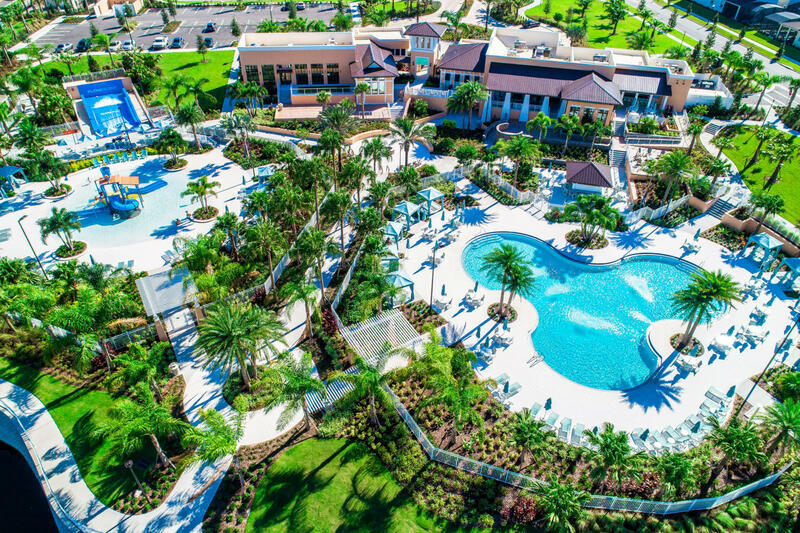 Solara Resort is a 10 minutes driving from the famous Walt Disney World. 100% of the total amount is refundable until 30 day/s before arrival. I'm a professional property manager and I manage 150+ pool homes, condos and townhomes all within 15 minutes from Walt Disney World. We are available 24/7 in case you need assistance during your stay. All our homes are professionally managed, licensed and comply with all local safety and hygiene regulations. Our rates include all local taxes.